We make visiting a medical practice very process-oriented rather than people-oriented. We need to look at how we can get back or gain some momentum in terms of building those relationships with patients. It starts with how we greet the patient and making them feel that we really care. Once you get the patients on your side, you have a happier patient, probably even a more adherent patient, and you certainly reduce a lot of steps in the office. NC: From your perspective, what are patients really looking for from their doctors? JC: Well, they want to feel valued. They feel they're not heard. They feel unimportant. They feel like they're going through a maze just to be able to talk to their doctor. Physicians and medical practices need to take responsibility and say, "How can we make our patients feel valuable?" These are a few suggestions we are brought in to work with healthcare organizations. If you use the patient’s name often on the phone and during their visit, they start to feel like you're really connecting with them. Repeat the patient’s name often and ask them some questions. When Mrs. Smith comes to the front office to check in say, "Hi, Mrs. Smith. How are you today?" This isn’t difficult. This was before EMRs but I recall seeing yellow sticky notes on a patient's chart that would say something like, "Going to Hawaii June 1st." So when the patient visits in July, the question would be, "Oh how was your trip to Hawaii?" Wow! Now, we've got an ultimate partnership. With EMR’s its much easier to track personal information to comment on at another visit. Try to get the “No” word out of the dialog with a patient. “No” is a surefire way to destroy the potential for a true partnership. Sure, there are policies and procedures that can’t be violated, but there are ways to deal with the patient without saying “No.” Here’s an example. A patient might say, "I'd like to come in on Monday at nine o'clock" and you know there's no way possible to give that appointment. You can accommodate them in a different manner rather than saying, "No." Just say, "Well, Mary, there is an appointment available Tuesday at nine or we can see you later in the day on Monday, which would you prefer?" Glass windows that separate the receptionist from the patient at check-in doesn’t make it personal. Ditto for a sign-in sheet. Not personal. Fortunately, we have seen the glass window less often in recent years, but the sign-in sheet remains conspicuously on the check-in counter. Whether staff and practice leaders realize it or not it gives the message the staff really isn’t required to greet the patient and that’s a big mistake. Remember that from the doctor or non-clinical staff member, "Is there anything else I can do for you today?" is a powerful statement as long as you're willing to follow it up. NC: Do you have any other suggestions for us about how a practice can become more patient-friendly? JC: One of the ways you can make your practice patient-friendly is to try and look at your practice from your patient's eyes, and find out what your patients want from you. Let’s say you have 20 new patients a month that roll into your practice. Why not take one out of every four and ask them, on their way out, if they would mind sitting down, to answer five to six questions you want to ask them, to get some feedback on the practice? If you do that for a few months, you'll start to see the common threads and areas you’ll need to work on – and it makes the patients feel like they are contributing to the partnership. 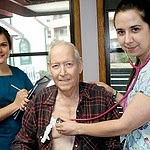 Another suggestion is to look at the patient as a person when they come into the office and not just as a condition. Notice their body language when they walk through the door. See if they are upset or frustrated, feeling sick or frightened. And communicate with them accordingly. NC: So, I guess the most important person in a practice is not the doctor. It's not the administrator. It's not the coder or biller. It's the patient. JC: That's right. The patient is your job – and if they’re happy it makes your job easier, and both of you are more satisfied. That says it all. Judy Capko is the author of Secrets of the Best-Run Practices, 2nd Edition published by Greenbranch Publishing. And of the brand new book, along with Cheryl Bisera, The Patient-Centered Payoff: Driving Practice Growth Through Image, Culture, and Patient Experience. You can get more by calling (800) 933-3711.